If you're a Madison resident and your children attend the public schools you're most likely well aware that the PARCC testing schedule started right after Spring Break. Kids (and parents) react in all different ways to the standardized testing. What that means is your house likely runs the gamut from disinterest to major anxiety. Regardless, it's testing. Sitting, reading, figuring out, clicking little answer boxes. It's draining. Thanks to Torey J Sabatini mom Beth Landau, our students have been surrounded by poetry for the month of April as well. 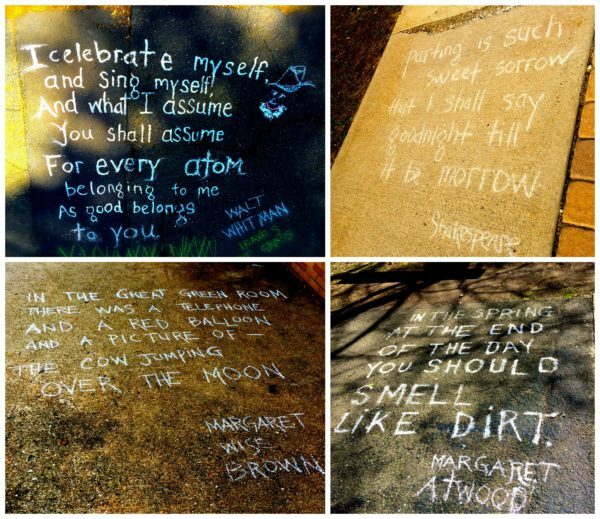 I bet a lot of you didn't realize that April is National Poetry Month! Beth has literally surrounded the TJS elementary students with poetry. Walls, stairs, floors... inside and out. "I hope it teaches the kids that education is not just putting in the right answer in the right place on PARCC," said Landau. "It's also discovering how words re-imagine their thoughts." TJS School Principal Michael Post has gotten into the celebration as well, reading a poem during morning announcements each day. Landau also arranged some special events this month. Last Friday was Poetry in your Pocket Day, and a team of parents handed out poems to students as they left school that day. There are poetry activities for each grade and at the end of the month poet Charlie Waters will come to work with the kids on a poetry workshop. Here are some photos of how the poems are displayed (the one on the stairs is particularly clever).